The second half of 2013 has been good to Sergio De La Pava. In August, he took home the $25,000 PEN/Robert W. Bingham Prize for his self-published (and then, ahem, republished) novel A Naked Singularity, awarded to “an exceptionally talented fiction writer whose debut work—a novel or collection of short stories—represents distinguished literary achievement and suggests great promise.” In September, he followed-up with Personae, a slim, inventive take on the detective novel, which features psychics, ekphrasis, a short play, and the same experimental and morally astute take on justice and responsibility as his previous, maximalist work of fiction. In case you missed it, the book was acclaimed here, here, here, here, over here, here, and here, among other places. 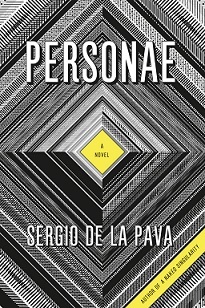 For our last post of the year, we thought we’d point out something else about De La Pava: as many already know, in addition to his literary pursuits, he works as a full-time public defender (though, of course, he is also “a writer who does not live in Brooklyn.”). Over at the Millions, as part of their series “A Year in Reading,” they asked De La Pava for his recommendations. And, as usual, De La Pava’s response gives us all something . . .
Leo Steinberg (1920–2011) was an art historian whose focus extended from the Renaissance to the modern, and who left a critical legacy on several generations of scholars, critics, and artists. One of his classic works. 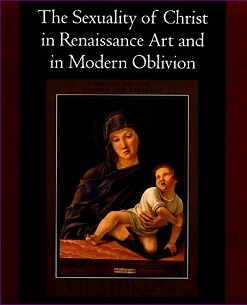 The Sexuality of Christ in Renaissance Art and in Modern Oblivion, addressed the as-yet-unsuspected eroticism of the iconographies devoted to Christ and Mary, which generated much controversy throughout Steinberg’s career. In a recent piece for the New Yorker’s Page-Turner blog, Lee Siegel uses Steinberg’s writing as a lens for understanding the correlation between Pope Francis’s embrace of gay Catholics and his devotion to the poor and afflicted. Here, Siegel notes a central tenet of Steinberg’s book, specifically that, “as a result of the rise of the Franciscan order, around 1260, an emphasis on Christ’s nakedness, and, thus, on his humanity, joined compassion to an acceptance of the role of sexuality in human life.” Siegel points out that a Renaissance-era credo of the Franciscan order, from which Pope Francis takes his name, was nudus nudum Christum sequi (“follow naked the naked Christ”). He goes on to account for how Steinberg’s art historical thesis implies a theological premise imperative to positions taken by the current Pope on . 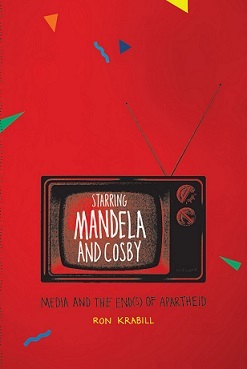 . .
Ron Krabill’s Starring Mandela and Cosby: Media and the End(s) of Apartheid (2010) considers the implications of a particular paradox: during the worst years of apartheid, the most popular show on television in South Africa—among both Black and White South Africans—was The Cosby Show. In the wake of the death of Nelson Mandela, Krabill’s emphasis on how the esteemed human rights advocate and then political prisoner’s image was rendered invisible (it was illegal to publish photos of Mandela) just as Bill Cosby became the most recognizable Black man in the country, remains integral to understanding the crucial role media played during the end of apartheid. The argument advanced in Starring Mandela and Cosby, which contends that Cosby’s presence in the living rooms of White South Africans helped lay the groundwork for Mandela’s release and ascension to power, speaks to the influence of a shared space for communication in a deeply divided nation. In light of Mandela’s death, the book recalls a time when American popular culture’s icon of middle-class African American life was necessarily substituted for one of the world’s most admired public figures—and the social and political consequences of this exchange. An excerpt from the book’s Introduction follows after the . 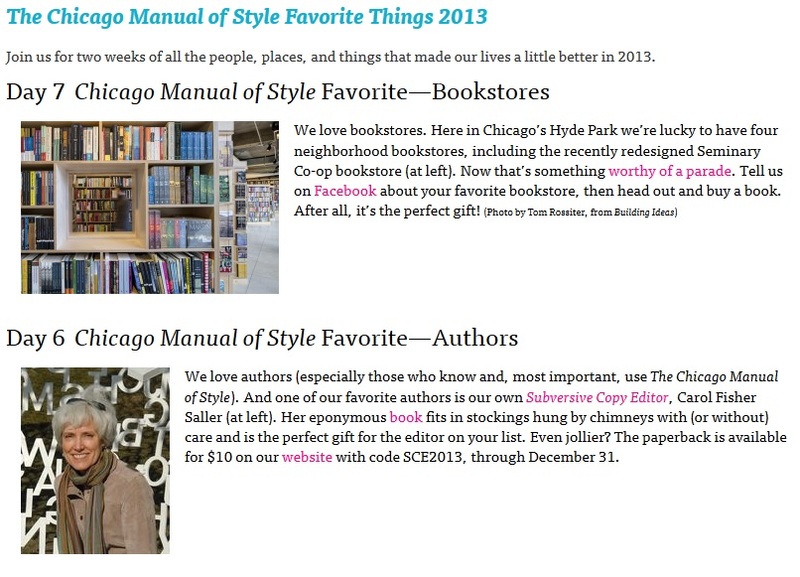 . .
Our colleagues at the Chicago Manual of Style blog have been counting down the days to the new year with a series of short features on their “Favorite Things” from 2013. Have a look at the site here, or by clicking the image above—you’ll find fodder and stylistic ephemera, from bookstores to champion and preferred typographic treatments to foolproof dictionaries and nods to college English teachers. Among those favored? Our own Carol Fisher Saller, author of The Subversive Copy Editor, whose eponymous book is available via the University of Chicago Press website through December 31 for $10 (with discount code SCE2013). Happy holidays from and for everyone who works with words! . 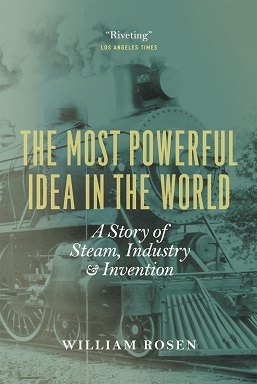 . .
William Rosen’s The Most Powerful Idea in the World: A Story of Steam, Industry, and Invention considers how scientific and intellectual breakthroughs—specifically, the burgeoning field of mechanical engineering and its resultant affect on patent law—ushered in the development of the steam engine, and thus, the Industrial Revolution. In a February 2013 post for his GatesNotes blog, tech impresario and philanthropist–entrepreneur Bill Gates praised the book as, “an entertaining narrative weaving together the clever characters, incremental innovations, and historical context behind the engines that give birth to our modern world.” In his review, Gates contextualized how the interrelationship between intellectual property and public disclosure became integral to the culture of late nineteenth-century democratic invention: The book’s premise is that the Anglophone world—England, Scotland, Wales, and America—was the epicenter of the Industrial Revolution because it “democratized the nature of invention.” Rosen makes a compelling argument that the steam engine is the quintessential example of that democratization at work. I won’t spoil it by telling all the reasons why, but suffice it to say one of the most important was the advent of patent protection. Patents were a holdover of monopolies granted by kings over businesses such as sugar and tobacco, later evolving . . .
Michael Kammen (1936–2013) “Underpinned by exhaustive research and abundant documentation, Professor Kammen’s books, essays and criticism—he was a frequent contributor to the New York Times Book Review and other publications—were noteworthy for remaining accessible to the general reader. His work, which stood at the nexus of history, folklore, psychology and sociology, helped cast the form of the modern scholarly field known as memory studies.” This clip, culled from the New York Times obituary, helps contextualize the prolific contributions of Pulitzer Prize–winning historian, American culture scholar, and longtime Cornell University professor Michael Kammen, who passed away earlier this month after a long illness. 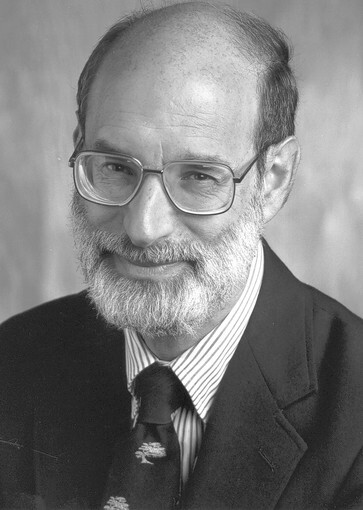 The Newton C. Farr Professor of American History and Culture emeritus at Cornell University, Kammen authored more than a dozen volumes situated between history, remembrance, and the composition of American character, including People of Paradox: An Inquiry Concerning the Origins of American Civilization, which won the 1973 Pulitzer Prize for history. In addition to his frequent scholarship and journalistic contributions, Kammen also served as past president of the Organization of American Historians (1995–96) and was a member of the American Academy of Arts and Sciences. His final book Digging Up the Dead: A History of Notable American Reburials was published . 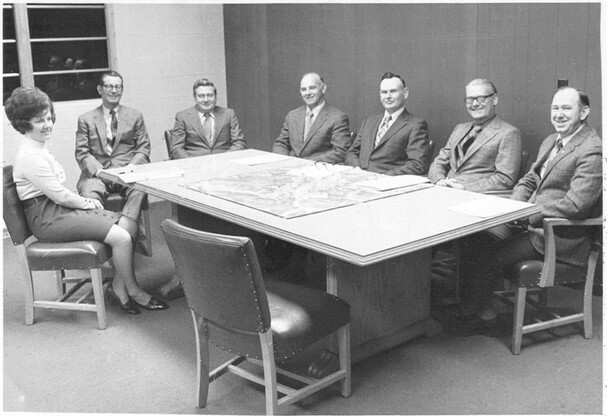 . .
Pigeon Forge (TN) City Council, c. early 1970s, photographer unknown Pigeon Forge, Tennessee (population: 5,875) Pilgrimage to Dollywood: A Country Music Road Trip through Tennessee Forthcoming April 2014 . . .
Chicago Shorts offer distinguished selections, including never-before-published material, off-the-radar reads culled from the University of Chicago Press’s commanding archive, and the best of our newest books, all priced for impulse buying and presented exclusively in DRM-free e-book format. 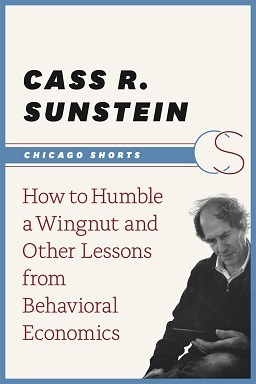 With that in mind, we’re delighted to announce the debut of our latest Short: How to Humble a Wingnut and Other Lessons from Behavioral Economics by Cass R. Sunstein. *** In How to Humble a Wingnut, leading constitutional scholar, behavioral economist, and former Administrator of the White House Office of Information and Regulatory Affairs Cass R. Sunstein examines the unconventional impetuses behind human decision-making. Why it is that people often choose to behave so strangely? Sunstein’s incisive commentaries point to recent empirical findings to demonstrate how and why people convince themselves they are right despite evidence to the contrary; fear dangers they are unlikely to encounter; and ignore real risks. Mining developments in recent behavioral studies for tips on everything from holiday shopping and political biases to staying healthy and clear thinking in general, Sunstein nudges his reader towards that rarest of grounds—understanding. To read more about How to Humble a Wingnut, go here. To see the full series of Chicago Shorts, . 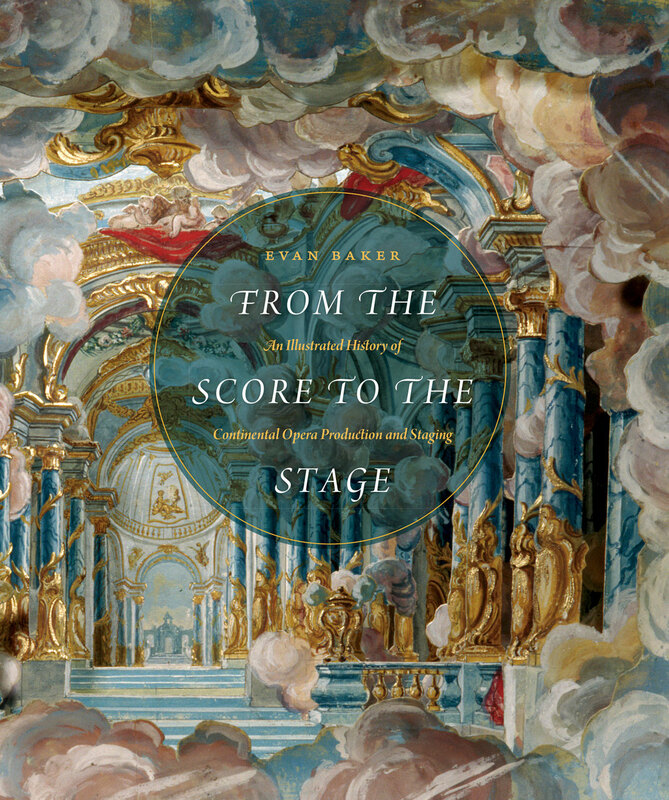 . .
An excerpt via From the Score to the Stage: An Illustrated History of Continental Opera Production and Staging by Evan Baker Composers frequently involved themselves in the frenetic activities at the theater leading up to the first performances of their new operas, constantly fine-tuning the score and the libretto during the rehearsals. As happens in today’s productions, composers in the eighteenth century would modify the music to accommodate a singer’s strength and weaknesses. These changes often affected the staging and the production itself. The circumstances surrounding Wolfgang Amadeus Mozart’s preparations for the premiere of his newly commissioned Idomeneo, re di Creta (Idomeneus, King of Crete) at the Munich Residenztheater in January 1781 were no exception. The last months of 1780 found the composer in Munich completing his work. Thanks to the extant correspondence between Mozart and his father, Leopold, we are able to read about three of the many problems he encountered: the lack of stage presence on the part of several singers despite their musical talents; the questionable theatrical and dramatic effectiveness of Idomeneo’s first entrance; and difficulties with the final scene, Neptune’s proclamation and judgment of Idomeneo. The letters are extraordinary for their glimpse into both the creative . 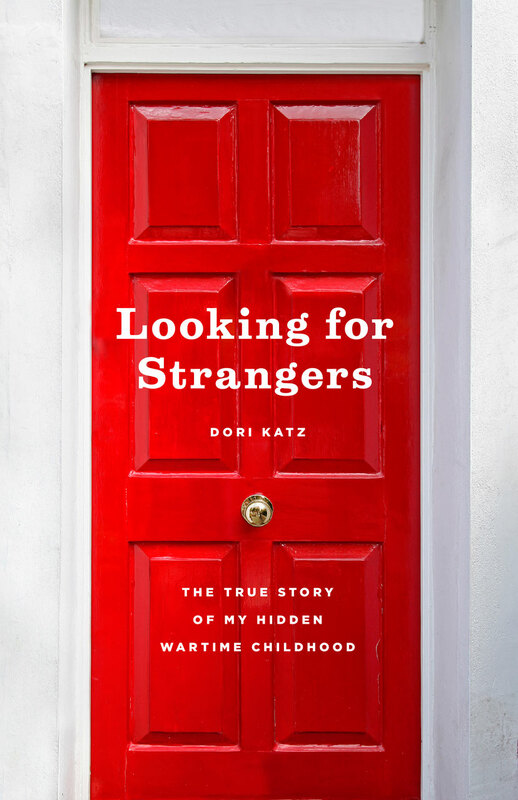 . .
An excerpt from Looking for Strangers: The True Story of My Hidden Wartime Childhood by Dori Katz INTRODUCTION I knew it was my mother when the telephone rang that morning, not only because she always called me around that time on Sundays, but also because I thought the ring sounded angry and reproachful. “So, you’re really going to Belgium,” she said, wasting no time for introductory niceties when I picked up the phone. “Hi, Mom, fine—thanks, and you?” I answered, and then told her that I hadn’t changed my mind. She repeated all the objections she had already voiced when I stated my intentions to search for the strangers who had hidden me during the war. She reminded me that it had been over forty years ago. “You were a child then; for you, it was nothing,” she told me. “You can’t possibly remember anything about that time; those people did it for money. What makes you think they’ll be glad to see you ? Besides, they’re probably dead by now.” “I don’t care,” I replied. “I want to find out. I’m going.” “Why are you doing this?” she asked again. It was hard to answer, since I couldn’t even articulate to myself . . .